Perhaps it was the possession of the ill-fated and cursed Hope Diamond which destined Mary Augusta Yohé to a life of infamy and ruin. Nonetheless, you must say that her fate was that of a series of missteps and foolish actions–rather in the vein of Lily Bart–with which the ebullient American musical actress chose to guide her life. Mary Augusta, known henceforth as “May,” was born in Bethlehem, Pennsylvania on April 6, 1866 to William W. Yohé, a former officer of a Pennsylvania Regiment during the Civil War, and Lizzie Batcheller, the daughter of a hotel proprietor. The two separated sometime during May’s childhood, and Lizzie supported the two with a successful business (of which has yet to be revealed) in Philadelphia. May’s father, William, was known for his dark good looks and musical talents, and Lizzie spent her free time singing in church choirs. Lizzie had apparently acquired enough money and success to send twelve year old May abroad for her education, and three years later she returned home, pretty, polished, and poised. However, May wanted to go on stage. She went in as chorus girl, and within a few years she emerged as a star after a well received turn as “Prince Prettywitz” in the Crystal Slipper at the Chicago Opera House in the summer of 1887. From then on, May’s career was a dazzling success, a success which baffled her critics, who found her “an indifferent actress [who] does not possess good stage presence, and has a figure by no means striking.” But perhaps that was what audiences desired: a beautiful woman who was on stage to have fun. 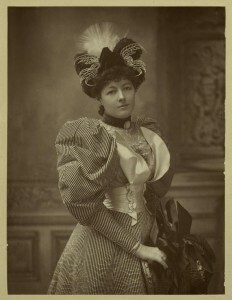 By the early 1890s, May was famous for another reason: her rumored elopement with Lord Francis Hope, the younger brother and heir presumptive to the Duke of Newcastle-under-Lyne, who was owner of a half-dissipated estate. Lord Francis himself, who acquired the surname “Hope” and the legendary Hope Diamond from a grandmother’s bequest, was in dire financial straits, and after his quiet 1894 marriage to May, he and she continued their extravagant ways. Not even a year later, the two had frittered away his entire inheritance–the land, the estates, the pictures, the heirlooms, and the Hope Diamond. But as a future Duke and Duchess, Lord and Lady Francis Hope could beg or borrow on their expectations, which they did, further increasing their exorbitant debts. In 1900, flush with ill-gotten wealth, Francis and May undertook a world tour. On their way home, they acquired an acquaintance, the dashing Captain Putnam Bradlee Strong, who was one of the most popular officers in the US Army and a particular favorite of President McKinley. May took one look at Captain Strong and fell head over heels in love. Rather than continue on to England with Lord Francis and, in the manner of the well-born Englishwoman of the day, keep Captain Strong as a lover, May deserted her husband for her darling Bradlee (American women were much too sentimental and conventional to English eyes). May became Mrs Strong in San Francisco, but within two years, their quarrels and relative poverty tore apart the marriage, and she charged that Captain Strong made off with £20,000 worth of jewelry. Strong appeared in London soon after to denounce this claim, and May followed him, where a reconciliation was had. Very interesting post. I think I’ve heard of her before but her story is so sad. She should have stuck to the stage or at least just taken Captain Bradlee as a lover instead of a husband. ohh! love it! What a great lady to start the series with! Well, she was making more money than I do! @ Elizabeth: She certainly should have! But “l’amour, l’amour,” as the Countess in The Women would proclaim. @Lauren: Thank you! I wanted to feature an American “heiress” and May was an anomaly in the canon. @heidenkind: Me too! Especially considering that $16.50 in 2010 dollars is $200! Capt Strong and May ran away to Japan via San Francisco but were not married yet, Hope and May finalized their divorce while she was in Asia with Strong. Thank you Eva! What is the name of the book? Would you mind if I conducted an interview with you about the book? I hope it does get published. I love reading biographies of long-neglected women of this period! I think it was from her preference for younger men! Great work on Mary Augusta Yohe – you did your homework! ps – she has a facebook page! I’m loving all of this new information about May Yohe! I actually found a good dose of my information from genealogy forums, and the rest from the archives of The New York Times. Thanks for stopping by and filling in even more holes in her biography! Thank you all for the information you posted about May. I’ve had an interest in her life for many years as she was related to my beloved grandma who led quite a colorful life herself. Seems “wild women” run in my family. I’ve acquired a few pieces of memorabilia from May’s career that I treasure and keep on display over my piano. I’m just learning how to do genealogical research and am looking forward to finding out just how we’re related and more about her life.